Frequently, past clients called me in a state of panic becuase they have filed for bankruptcy, but they are being served with foreclosure papers. "Doesn't the bank know that I filed for bankruptcy? ", they ask. Bankruptcy discharges the underlying mortgage debt but not the bank's security interest. In other words, the mortgage holder can force a sale of the home but can't sue the borrower for money damages. Yes, the foreclosure complaint is scary and it looks like the borrower needs to respond, but a foreclosure action only seeks to extinguish the borrower's right of ownership and possession. It does not seek to collect monetarily from the borrower. Sometimes, after the property is sold, the mortgage holder will start a deficiency action - that is an action in which it seeks to collect the difference between the amount owed and the amount recieved from the foreclosure sale. On rare occasions, the mortgage holder can forego a foreclosure and sue just on the underlying note. In either of these cases, a borrower that has filed for bankruptcy is protected and the action can not continue. So how does one know when to be concerned. Simple. If the docket number begins with an "F", than it is a foreclosure action and no action is necessary (unless you believe you have a defense, or want to keep the home and make payments). Of course I explain this to my clients at every initial meeting, but I understand that it is a scary event and sympathetic to their concerns. 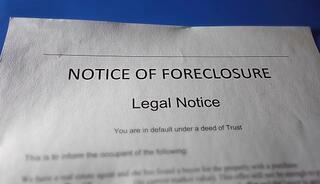 Contact us to speak to a foreclosure attorney about your situation.